Programs itself. Saves energy. Nest is the first thermostat that learns from you. Stay comfortable when you're home, save energy when you're away. Nest programs itself in about a week. It creates a personalized schedule based on the temperature changes you've made. This flexible schedule adapts to your changing life. The Nest Leaf appears when you set a temperature that saves you energy-and money. The Leaf guides you in the right direction and helps you be energy-efficient. About two hours after you've left the house, Nest will sense you've gone and adjust the temperature to avoid heating or cooling an empty home. Nest shows you how much energy you've used and if your temperature adjustments, Auto-Away or the weather affected your energy use most. The Nest T100577 is designed with style in mind. Equipping this thermostat will add class and sophistication in any living space. 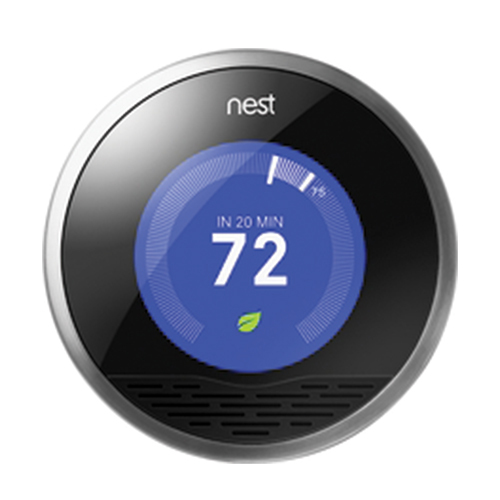 Never before has a thermostat been so visually impressive while providing breakthrough functionality. 1 year manufacturer's direct warranty.